As with our previous visit to Ostend we made use of any Belgian city ticket which lets you travel to Brussels via the Eurostar and then catch another train onwards from Brussels to your final destination, which for us was Ostend. 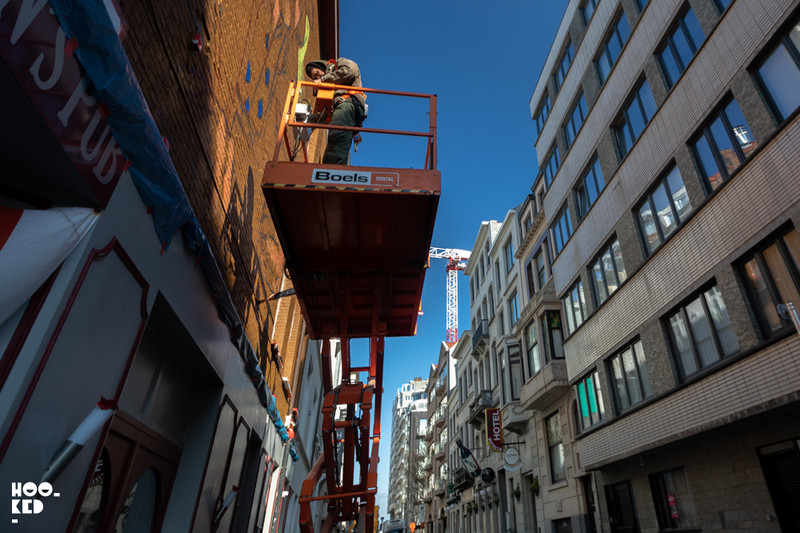 Set to officially open on April 13thth a number of the invited International and national street artists have been in Ostend for close to a week now and some have already completed their murals. But there is still plenty of action to be seen on the streets and the walls of the city by the sea. 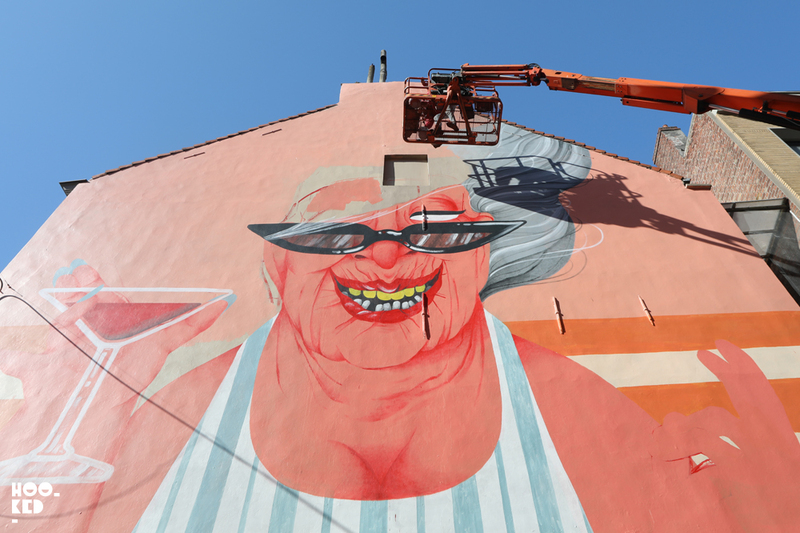 In total fourteen artists are taking part in 2019 edition of The Crystal Ship festival, all adding new works to the city, some focusing on one-off larger murals with others such as street artists such as Belgian street artist Jaune and Helen Bur installing multiple smaller scale street pieces right across Ostend. Straight of the train at Ostend to the Upstairshotel to check-in, bags dropped followed by a much-needed coffee after our early start and we wasted no time hitting the streets to see if we could catch any artists at work. Walking through the city center it wasn’t long before we were spotting the works of artists from previous editions as well as some new works in progress for this year's edition. Here are some highlights from our first day in Ostend. 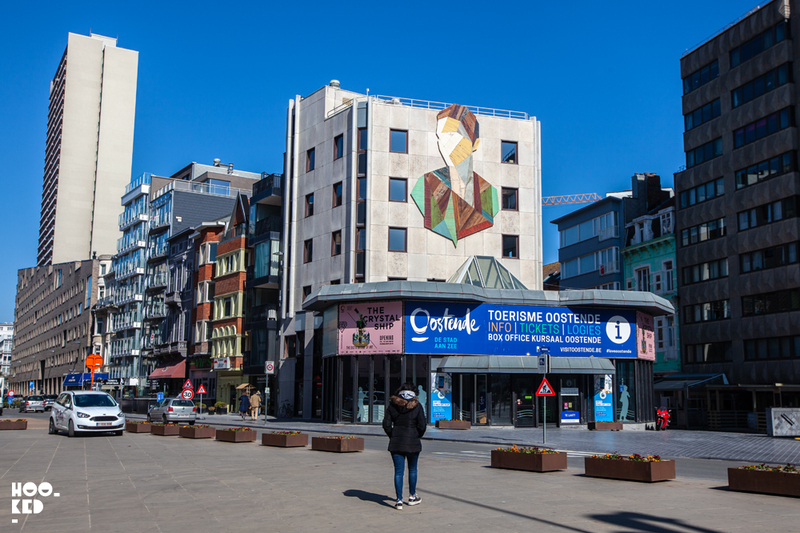 Just next to our hotel and above the Tourist Office was the work of Belgium artist Strook pictured above from last years festival still looking great under the crisp blue skies. 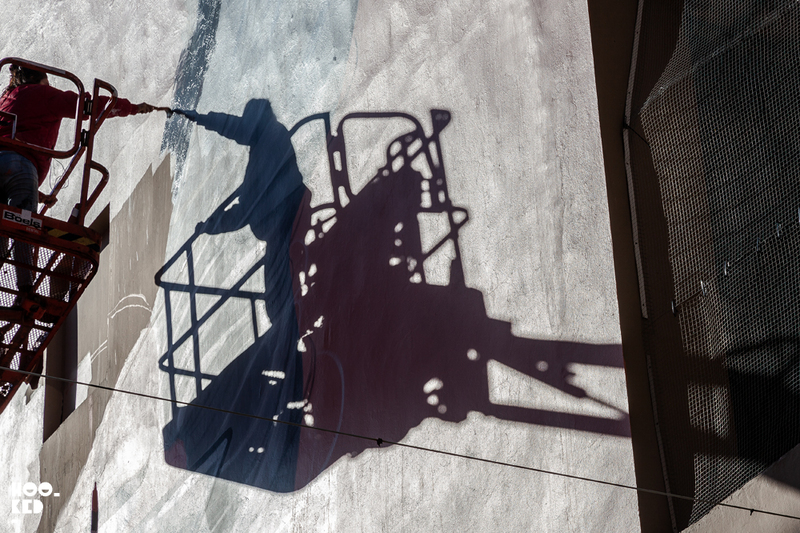 German artist Case Maclaim takes to the skies making a start on his mural located just around the corner from the Crystal Ships Headquarters. 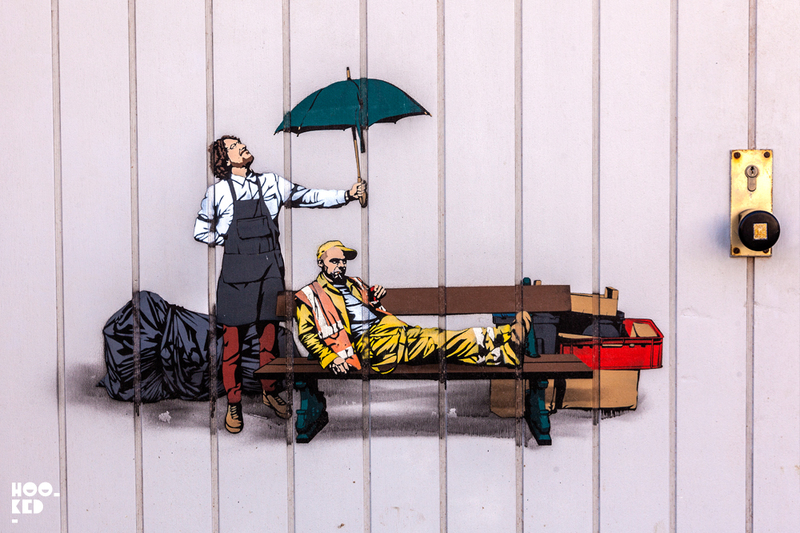 One of a large number of miniature stencil artworks around the city painted by Belgian street artist Jaune from the first three editions of the festival. Jaune is back again this year focusing his energy on one large wall next to the beach front. 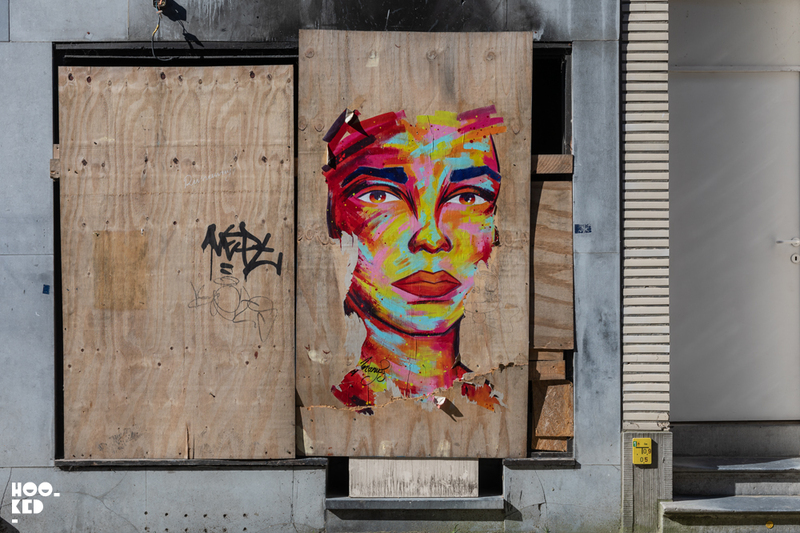 French Street artist Manyoly was in London last week installing new paper works but we also caught up with her last year at the 2018 edition of the festival when she wheat-pasted up a number of her large vibrant portraits on the cities walls. A year later and this huge piece is surprising still up and running having survived an Ostend winter. 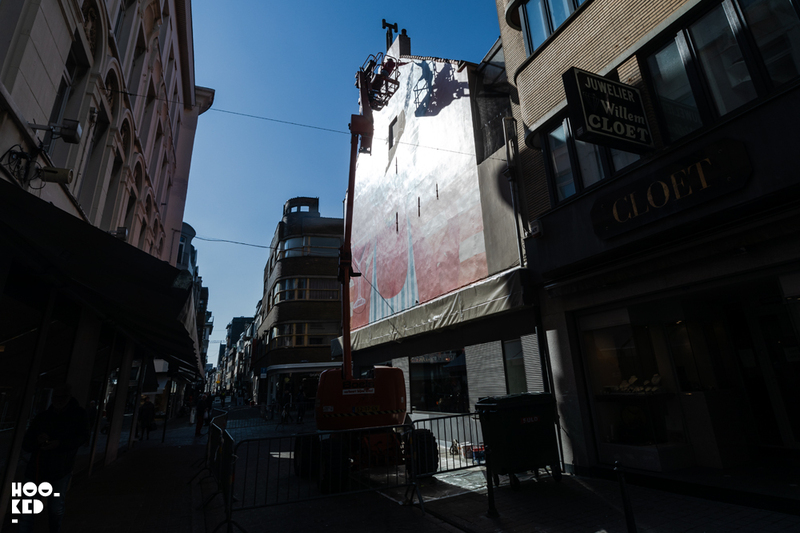 Next up we stumbled upon the Spanish artist Marina Capdevila, busy at work on her piece high above the busy main shopping streets. We are big fans of the artists work and are looking forward to seeing the mural finished you can see from the photo below the piece is gonna be wild! Just around the next street and we came across another Helen Bur making a start on one of her small scale street paintings. Helen was painting a portrait of the shop owner whose wall she was working on. 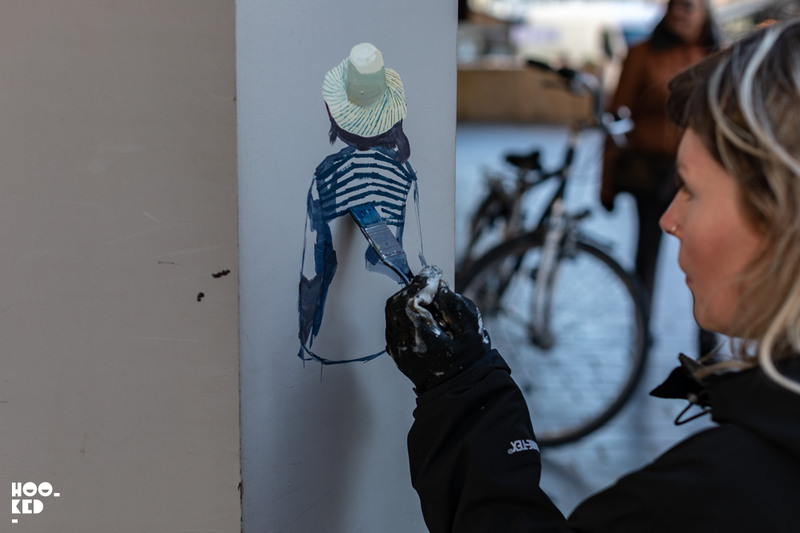 She has done a whole series of these small scale piece around Ostend and we look forward to tracking them down. 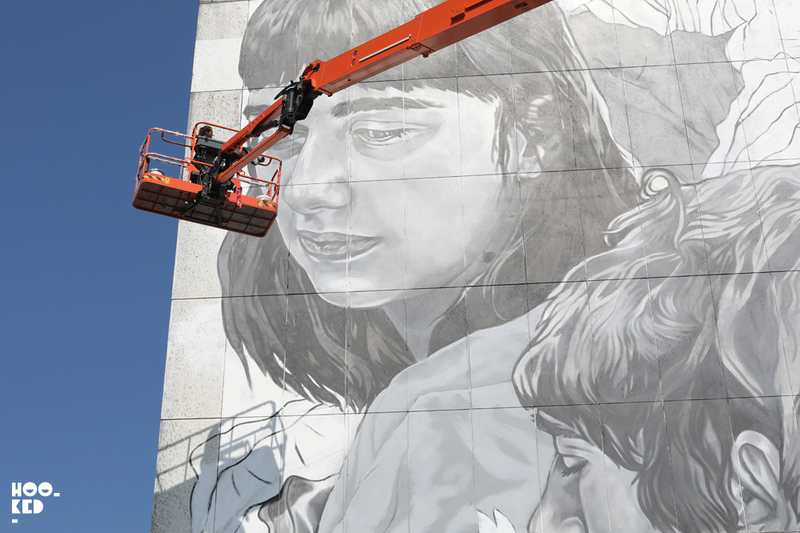 A little further outside the city center, we caught a glimpse of Mexican artist Paola Delfin working on one of the largest murals of the festival, only 40M or so high!!. This is our first time seeing Paola at work and what a wall to see her work her magic on. With a wall, this scale of the amount of detail she puts into her work we expect she will be a few more days before finishing the impressive wall and we can't wait to finish, stay tuned. Hookedblog are bringing you coverage from The Crystal Ship Festival across our social channels so make sure to join us over on our Hookedblog Twitter account or join us on Instagram and follow our daily adventures via our Hookedblog #InstagramStories. We will also be sharing highlights on the blog from our trip for those of you not using Instagram, so stay tuned.